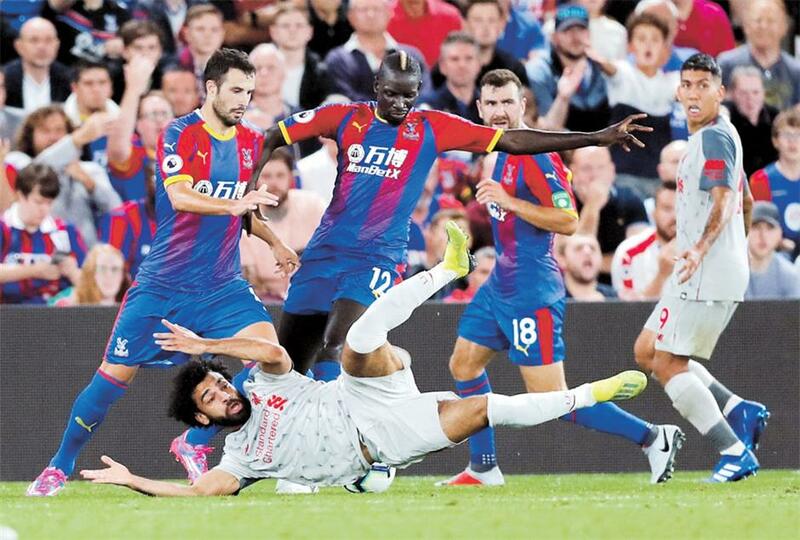 Crystal Palace’s Mamadou Sakho (center) concedes a penalty against Liverpool’s Mohamed Salah in Monday’s English Premier League clash at Selhurst Park in London. Former Manchester United defender Gary Neville, working as a pundit, claimed it was a dive, saying: “A lot of people won’t like it. If it’s against you, you’ll think it’s soft. Palace boss Roy Hodgson was furious with the penalty. “My frustration is I don’t think that’s a penalty,” Hodgson said. “It’s cause for anger and disappointment. I’ve been in football a long time. If that’s a penalty the game has changed beyond all recognition. After Manchester City’s swaggering demolition of Huddersfield on Sunday, it was important for Liverpool to keep pace with the champions, even at this early stage of the season. This was a statement win for Klopp’s team, installed as City’s most likely challengers, and they move into second place after building on last weekend’s rout of West Ham. Salah has previous for diving and incensed Palace fans were quick to aim “cheat” chants at him, but there appeared just enough contact to warrant the spot-kick. Milner, ignoring the sound and fury, nervelessly sent Wayne Hennessey the wrong way with his spot-kick.